Another Binding…I am on a roll! Last winter I had a blast making this scrappy quilt designed by Edyta Sitar of Laundry Basket Quilts. It was a Craftsy class which I purchased and I highly recommend it….making this quilt put quite a dent in my scrap pile. Here is a blog post showing a few progress photos. I also used this opportunity to stitch the backing out of a pile of unfinished projects. The quilt was machine quilted by Colleen Dadd of Elite Quilting some time ago and so the quilt has been sitting on a chair waiting patiently for a binding, along with a few other quilt and wallhangings. Since I am on a mission to finish these lonely quilts, I spent the weekend stitching on the binding, hand stitching the binding down (while binge watching Mr. Selfridge…thank you Netflix). So I started to think about a label and since this quilt is for my daughter Kelly’s 30th birthday (which was last November) I thought I would play around on my new sewing machine. I purchased a Janome Skyline 5 last January and I haven’t really done much with it until recently. It comes with many different decorative stitches and it also comes with an alphabet. With Instruction Manual in hand, I sat down and started to play. I cut the sections apart and used the same fabric from the left over binding to put spacers in between the lettering. The label turned out much bigger than I planned…who am I kidding? I didn’t have a plan! The point is, Kelly loved it and I had a ball making this quilt from start to finish! 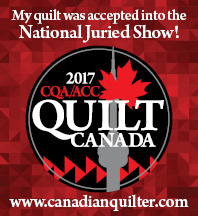 So…have you had a chance to look at the Catalogue of Classes for the upcoming Academy of Applique in 2018? I am teaching 2 classes and I cannot wait. I am very excited to be part of such an awesome event. I hope to see you there:) This is what I will be teaching…. « What a Difference a Binding Makes! Are you skinny little borders done with bias? They really show off the centre elements. Well done! What a beautiful quilt you did in the Craftsy class! I am ashamed to admit that I bought a Craftsy class once, over a year ago… And I have not watched it yet, and I probably never will. I think it’s just not my thing. Can’t stand quilt shows, either, and not much for classes — give me a BOOK and a PATTERN over a video any day of the week. I need to highlight, make notes in the margin, and put sticky flags all over the place so I can find the information when I need it again, without having to load up a video and try to fast forward and rewind until I stumble across what I need! Your applique for the upcoming classes is just lovely, especially the second one. Well, I have my fingers crossed that I can get into your class. I can’t imagine how the phone lines are going to handle it, but I’m going to give it my best shot. Hope to finally meet you in person.